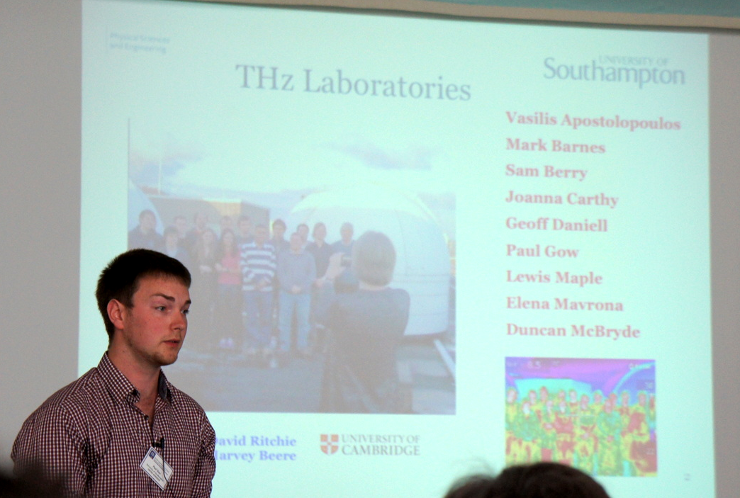 PhD students Paul Gow and Duncan McBryde presented their research at a Terahertz (THz) conference in Italy. Paul presented his work on multiplexing THz photo-Dember emitters by using a cylindrical lens array to a large audience. Duncan presented his poster on the characterising photo-Dember emitters on semi-insulting Gallium Arsenide (SI-GaAs) and low-temperature grown Gallium Arsenide (LTG-GaAs). Such research has applications in the medical and security industries where THz spectroscopy is relatively new. General features of the terahertz of the THz spectrum include strong absorptions in metals and water, and transparency to papers, plastics, and ceramics. Yes we have tried to set up a THz forum for just that kind of thing. Just need to advertise it a bit more so that people start to use it. There is a link on our website so do feel free to take a look. Hopefully it will take off in the future.